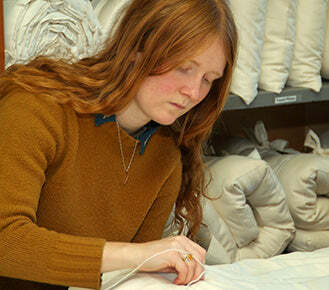 At Holy Lamb Organics, we are a small manufacturing company dedicated to creating exceptional natural bedding products. We make it by hand, locally, in a small rural town near Olympia, WA in the historic "Little Bit" General Store built in 1902 which served the Oakville community for over 85 years. We have been in business since 2000. Our bedding line is featured in over 80 stores across the USA and Canada and we currently employ approx 17-25 people at any given time. Our specialty is using only organic cotton fabrics and local Premium Eco-Wool, paired with our Zero-Waste manufacturing and sustainability practices in every step to bring you the very best. Our business foundation is rooted in sustainable choices for everyone involved. We’ve considered each step in our manufacturing process and have minimized our eco footprint right from the start. How we make our natural bedding is equally as important as what we make. Every aspect of how we do business, what we make and how we make it has gone through careful consideration and conscious choice-making. Permaculture principles applied through every fabric of this company. ReKindle Program: Up-cycling small pieces of fabric and wool into useful products. See all of our ReKindle Products. Free Bin to giveaway or donate to schools for their creative projects. Our tiniest fabric bits and threads are composted or mulched. 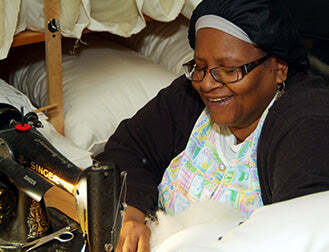 Cradle to Grave Practices: We create bedding that is does no harm. You may return your bedding to the earth by recycling or re-purposing it, doing no harm to the land, animals or people who live here. Learn more about our Zero Waste Policies. Top of the line wool grown by small USA sheep farmers who participate in our Sustainable Wool Program. Discover more about our organic cotton and Premium Eco-Wool™. We guarantee that our facility is a dedicated scent-free environment. A good percentage of customers count on us to deliver scent-free products. Multiple Chemical Sensitivity (MCS) is a concern for many of our customers and employees. Our employees come to work using only natural and scent-free products. All of our cleaning products are guaranteed natural & safe. We ask our customers when visiting our showroom to be scent-free. We use natural building products, FSC lumber, and salvaged building materials for renovations to our manufacturing facility. In 2009, our building was insulated for the first time, and it was built in 1902! We chose a green insulation product called Aircrete for insulating the walls instead of fiberglass. It’s made of natural materials so benign you can eat it! Salvaged building materials are purchased from local reused building materials stores in our community. Sustainably harvested lumber is sourced locally, particularly from a leading forest steward Wild Thyme Farm an FSC™ (a certified sustainable permaculture tree farm with a 150 acre immaculate forest). Our woodwork is finished with non-toxic products. Recently installed efficient LED bulbs for all of our lighting. On time shipping: most of our orders ship within 1-5 days. Pretty good for products made by hand. This Is What You Support When You Make A Purchase. Before our comforters, toppers and pillows are sewn, stuffed and stitched, the raw materials must be precisely measured and cut according to specific instructions. The stitching, stuffing, tufting and finish work are completed and each piece is inspected for quality in craftsmanship. Throughout the whole creation of your bedding, each person on our team is invested in making a great product. All team members have the responsibility to check the quality before it goes on to the next step and the next person. We have an incredible production team of happy people making happy products. Every day. To promote health and well-being, and to strengthen an economy based on ecology through manufacturing a line of high quality, all-natural, made in the USA organic bedding products produced using sustainable and ecological practices. Holy Lamb Organics specializes in using only organic cotton fabrics and sustainable USA wool from the Western Regions. We are proud to be a zero waste company (reusing/recycling all of our production by-products) and are committed to providing exceptional customer service and quality products. Long before I became a mother, my business practices developed from a keen sense of responsibility...plus, I’ve always been really big fan of our planet. One question drove me: How would our business benefit both people and our planet? Part of the fun is part of the plan: find quality sustainable local producers in the USA and create fantastic bedding for your family. It’s an amazing game, and I feel blessed to have contributed for over 18 years.